Your child may need concrete explanations of what death is. For example, in a gentle way, you might say, "When a person dies, his or her body stops working. The heart stops beating and the body stops moving, eating, and breathing." Sometimes, young children may not understand that death is permanent and will ask questions like, "When is Daddy coming back?" or make statements like, "I am going to show Mommy my new picture." Continue to be concrete in your explanation. Use words like "died" and "dead," rather than "went to sleep," "your loss," or "passed away." While these phrases may seem gentler, they may also be confusing. Since young children often think literally, they may assume, for instance, that if others look hard enough, a "lost" parent could be found. 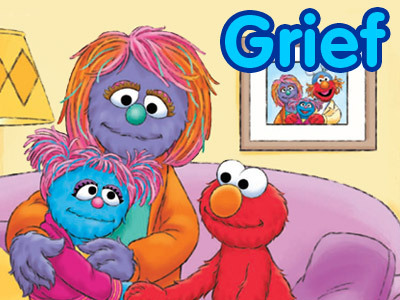 For some help with explaining death to your child, watch the video Talking About Uncle Jack" and use the conversation between Elmo and his dad as a model. Children may experience a wide range of feelings — anger, sadness, hopelessness, disappointment, confusion, loneliness, guilt, worry — but they may not always have the words to identify these emotions. Assure your child over and over that everyone, including yourself, has big feelings, and there are no feelings too big — or too little — to talk about. 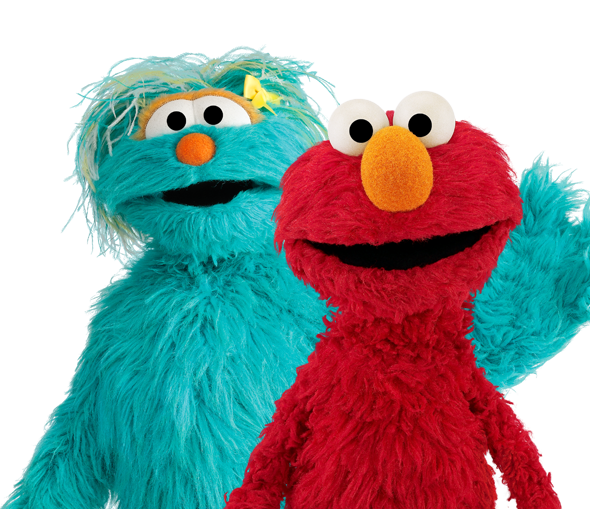 Watch Together:"Give Your Heart a Little Time"
Talk Together: What feelings did Elmo and Jesse express in the song? Using dolls and puppets, make up stories and act out feelings with your child. Drawing pictures could be a great way for younger children to communicate. For older children, writing in a journal may be helpful. 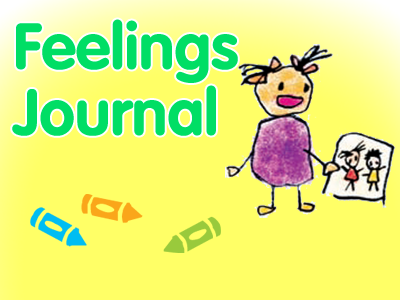 Download the "Feelings Journal" and use it as a way to help everyone in your family express emotions. If necessary, provide an outlet for your children to express anger or frustration. You might allow them to run outside, or give them play dough to pound on, beanbags to throw, or musical instruments with which to create noise. Listening to slow, soothing music and taking deep breaths can also help children feel more calm and relaxed. Above all, take time to listen. This will help you know where to lead the conversation. While you can't take away your children's difficult thoughts and feelings, you can make sure they know that you're listening to them. Talk Together: What types of things do you do to express your emotions? Some children may not want to talk about what happened right away; other children may want to talk to everyone about their feelings. The truth is that every person in your family may have a different way of communicating their feelings. Create a time and place for sharing and talking. For example, you might sit with your children and say, "I'm feeling_______. How are you feeling?" 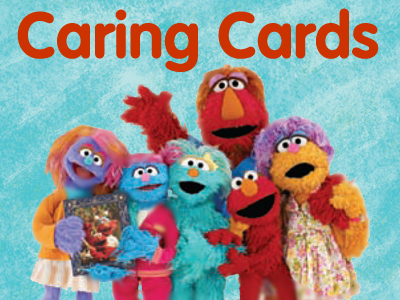 You might also want to download the "Caring Cards" and use them with your children to find strength as a family. Seek help from family, friends, and community ("Uncle Joey can take you to the park today" or "Cousin Emily can help with your homework"). Reassure your child that no one can ever take the place of the parent who died and that others want only to help your family. Your children may be able to open up to a favorite aunt or uncle or an older cousin or sibling. Some of the strategies that helped you express your feelings may be useful for your children, too. For example, you could let your child see you cry, or even cry together. Explain why you are crying. Reassure her that you are just feeling sad, that you are all right, and that it sometimes helps to let the feelings out in this way. Remind your child, "Change is hard for everyone, but I'm still here to love you, and we'll get through this together." Sometimes, children's reactions when coping with the death and absence of a parent can be especially severe. Some common feelings or behaviors might persist, grow in intensity, or occur more frequently, signaling a need for extra attention. If your children experience any concerning difficulties, such as bed-wetting or nightmares, or display behaviors that may be harmful to themselves or others, remember that it's OK to seek professional help. 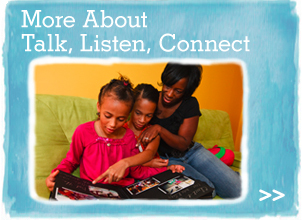 Watch Together: "You Can Talk to Me"
Do Together: Which family members can you talk to about your feelings? Plan with your child a smaller memorial gathering for close friends and family. Allow everyone to share memories and stories. It's OK to share funny memories and laughter, too! Listen to or sing a favorite song or eat a favorite meal dedicated to the memory of your loved one. Gather pictures, clothes, or favorite things of your loved one. Then take turns telling stories or writing about each item to remind all of you of the good times you shared. You could also record stories on your video camera or cell phone. Try downloading the "Memory Chain" and, as family, create a handmade remembrance of your loved one. Watch Together: "The Memory Box"
Talk Together: What would you put in a memory box? As your family heals, you can begin to think about the future in a positive way. Remember, you can still have fun and love the person who died. The death of a loved one is an experience that affects us all. These When Families Grieve resources will always be here to provide support to families during this most difficult time.